Hands-on lessons can be fun and compelling, but when it comes to life science, they aren't always possible, practical, effective, or safe. Children can't follow a lion as it stalks a gazelle, visit the exotic kapok tree in a rain forest, or swim alongside the underwater life in a pond. But they can explore a whole world of animals, plants, and ecosystems through the pages of beautifully illustrated, science-themed picture books. 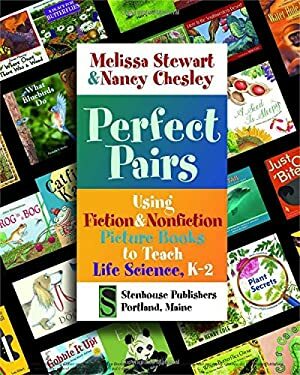 Perfect Pairs , which marries fiction and nonfiction picture books focused on life science, helps educators think about and teach life science in a whole new way. Each of the twenty-two lessons in this book is built around a pair of books that introduces a critical life science concept and guides students through an inquiry-based investigative process to explore that idea--from animal/environment interactions to the role of structure in plant and animal survival, from inheritance of traits to variation of species. Each lesson starts with a "Wonder Statement" and comprises three stages. "Engaging Students" features a hands-on activity that captures student interest, uncovers current thinking, and generates vocabulary. The heart of the investigative process, "Exploring with Students," spotlights the paired books as the teacher reads aloud and helps students find and organize information into data tables. "Encouraging Students to Draw Conclusions" shows students how to review and analyze the information they have collected. Bringing high-quality science-themed picture books into the classroom engages a broad range of students, addresses the Performance Expectations outlined in the Next Generation Science Standards, and supports the goals of the Common Core State Standards for English Language Arts. Even if you are science shy, Perfect Pairs can help you become a more confident teacher whose classroom buzzes with curious students eager to explore their natural world.